Hi guys! A few weeks ago I bought a mystery bag from KBShimmer for $20 and ended up receiving an impressive amount of product (6 polishes, a glass file, a bar of soap, and a mani shot). Needless to say, if you see these for sale anytime soon, pick one up because it's well worth it. The polishes I'll be showing are unfortunately discontinued, but it will give you an idea of the quality of products you can expect from KBShimmer. That, or you can find some of them on swap sites. 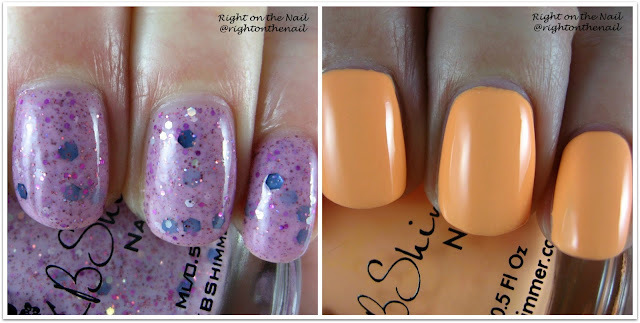 Shall we look at the polishes for tonight? Berry Patch is a polish that was around KBShimmer for a long time. I remember looking at the site several years ago (seriously) and wanting this polish. I never got around to buying it, so imagine my surprise when I opened my mystery bag! Berry Patch is a milky pink/purple crelly with blue, purple, pink, and holographic glitter. I think the name is perfect for this polish, and it reminds me of blueberries with raspberry seeds. It's really sheer, so unless you're willing to put on 3 heavy coats, you may want to use a base color first. The consistency is fine otherwise. Leggo My Mango is one of the few creme polishes from an indie brand. It's a bright orange creamsicle creme that still manages to have a muted feel to it. It's definitely not a safety cone neon orange color by any means. It's a pretty color, but I think it makes my skin tone look even paler than it is. It also has some application issues. Pastel colors are notoriously tricky, and this is no different. The first coat is extremely streaky and you will likely need 3 coats for full opacity. It hovers on the line of being gloopy, so good luck on getting thin coats. And thin coats are needed here.